Kasala Productions was so exceptional! 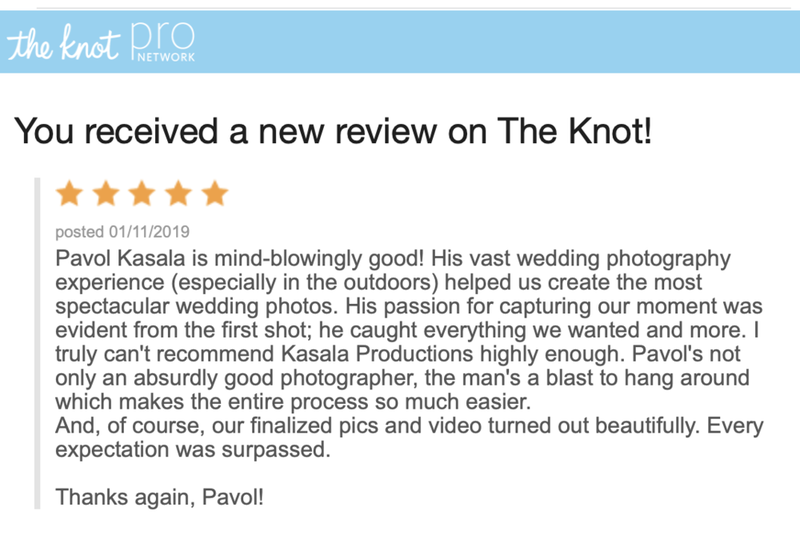 I would recommend Pavol Kasasla with Kasala Productions to anyone looking for a fun, emotional, and all encompassing wedding video. I was having a hard time deciding what to spend my money on, and what not to while planning my wedding. In turn, I decided I could not live without a video and went for it. I am so glad I did! I think it was the best money spent during the wedding. I was so impressed with the hard work and the attention to detail. Also, I loved the personal touch Pavol adds to the package he sends when finished with the video. Pavol and his assistance's are so kind and so good at what they do. Please hire Kasala Productions when planning your wedding! So Worth having a Wedding Video! I was skeptical about weather having a videographer would be worth the cost and intrusion. It was so worth it! Our big day was in a bit of a remote location so my family that couldn't make it really enjoyed it. It was wonderful for my husband and I to have the opportunity to watch the ceremony and toasts. The day is such a whirlwind and we were thankful to be able to relive those really important moments. Kasala Productions was great to work with, and as inconspicuous as possible. They knew exactly what to shoot with no direction! I'm so glad we have this amazing memento of our day! Kasala Productions did a wonderful job capturing our special day! This husband and wife team produces HIGH quality work in an extremely timely fashion. We received our wedding highlight video just a couple weeks after the day! They also mailed us 10-15 copies of our full wedding video to share with family members. The quality of the video is outstanding and they do a great job of including sound bites and music to complement the memories of the day! They went above and beyond what they were contracted to do and produced a third video capturing guest reaction to a slideshow that was shown during our wedding reception. I am so happy to have those memories. I've heard horror stories of how some videographers are always in your face on the wedding day but I honestly don't remember them being any trouble at all! They were so good about getting the shots we wanted without constantly being in our faces. They truly did a wonderful job and I would recommend them to any bride and groom! Pavol did a better job than I could even imagine. The video was creative, original, and matched our personalities 100%. He incorporated all of the moments and elements of the day and made it into a special and personal video that we will always have and treasure. He was extremely conscious of what we wanted and used that to create such warm images that really showed "us". If you are looking for a professional and outstanding video, he is the best choice for videography. Love it and thanks for your hard work. Kasala Productions goes above and beyond the call of duty. I found them on a search just by pure LUCK and we are so very thankful that we did!! Pavol and his wife Mary captured every detail of our wedding day and even some of our rehearsal. Which as the bride, everything comes and goes so fast that when it's all over, you wish that you could do it again so that you can catch and enjoy every detail. Kasla productions is so professional! They captured every important moment and detail from our facial expressions to all of our family and friends having a great time, but they did so very discreetly and very unobtrusively. I have actually watched wedding ceremonies and events get ruined by distracting cameras and cameramen! With Kasala, you won't have that problem. Just as importantly, you won't miss a thing on your wedding day. They then provide not only hard copies of the day, but links for family and friends to enjoy. You won't go wrong hiring Kasla Productions for your special day!! I highly recommend them! Lyssa was kind enough to forward the link to the video preview you put together of their special day. My husband Mike along with my parents watched it with tears running down our cheeks and goose bumps all over! It was stunning. You captured so much emotion in that short summary and we lived that moment again as if it was happening all over again. It was a pleasure working with you, your wife, and intern on both Friday and Saturday. Such warm, wonderful, and professional people you all are. Thank you seems slightly inadequate, but it is heartfelt and sincere. Thank you very much! We look forward along with Lyssa & Aaron to the completed work. Please know we will be recommending you to friends and family alike! I have to start off sincerely thanking both Pavol and Mary. They did an amazing job at our dream winter wonderland wedding. My husband and I did not get married in the most convenient of places. We got married mid-mountain at a local ski resort so the location was a bit tough to get to. While my husband and I were fortunate enough to catch a snowmobile to the ceremony cite Pavol and Mary had to walk the few hundred yards in the cold and snow. I never heard one complaint and felt really badly for doing that to them. Our day started off with Brett and I getting ready in our separate hotel rooms. Pavol and Mary were there to capture the whole thing. From getting my hair and makeup done, my dress being laced up and all the silliness in between. They were both always polite, helpful and gracious through the entire ordeal. One of my biggest praises about Pavol and Mary is that afterward looking back at all my photos they seemed to make themselves invisible to our photographers yet meanwhile capture every moment of our special day. They went above and beyond from the rehearsal dinner the night before, our group ski day, getting dressed, the ceremony, reception and the after party, they were there every step of the way always maintaining that same politeness and graciousness. The videos that they have put together for us have been absolutely amazing and am so pleased we were fortunate enough to have them there that day. When everyone tells you that the days is going to whisk by so quickly you'll barely remember it, it is so true. I am so pleased they were there to help me remember all those little moments that came and went so quickly. If you are looking for a great couple to provide a great service Pavol and Mary are the way to go. The value you receive with the two of them is worth every penny. 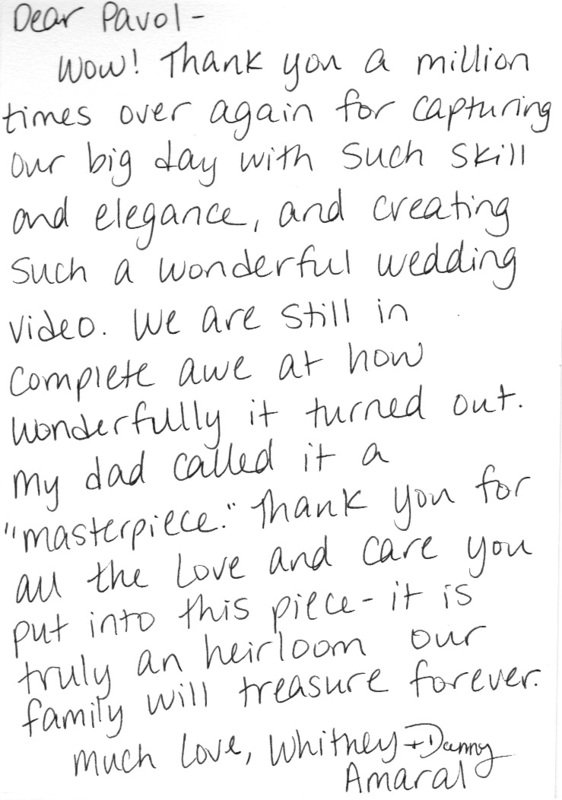 "We are so grateful that you were able to video Sarah & Yianis' wedding! 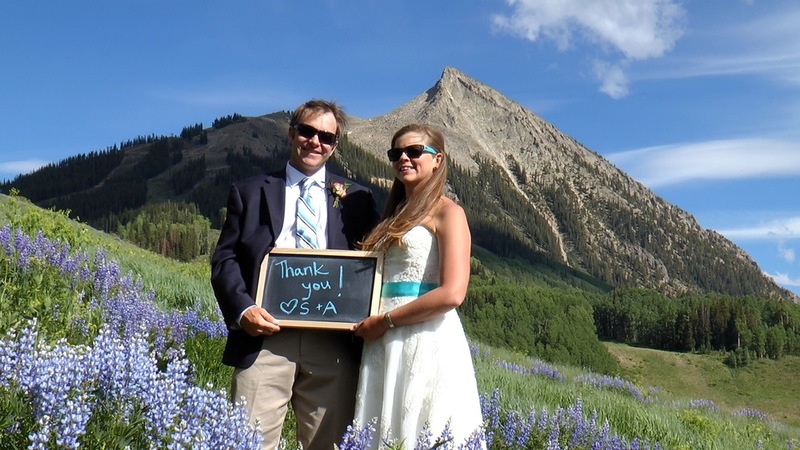 Words can't express how grateful we are for your most excellent and professional job of videography on our daughter's wedding in Crested Butte, Colorado! Every detail was taken care of perfectly. Everything from emailing and communication beforehand, setting up early, thinking of best shots and capturing every beautiful moment, also a quick return of emailing the video highlights after the wedding. We were impressed with the gentle and kind way you spoke and worked around the hustle & bustle of pre-wedding preparations. After viewing the video highlights, we are absolutely thrilled with the results! A wedding is a one time joyous occasion, which needs to be done right the first time ~ you have done it right and have exceeded our expectations! We couldn't be happier with the results and will completely recommend Pavol and Mary Kasala to every friend and family member in the future. The Pesek family has been blessed by knowing you and by your most excellent work. Jerome & Mary Pesek, parents of the bride"
I was so pleased to have chosen Pavol Kasala with Kasala Productions to capture and immortalize my rehearsal dinner, wedding ceremony, and wedding reception. 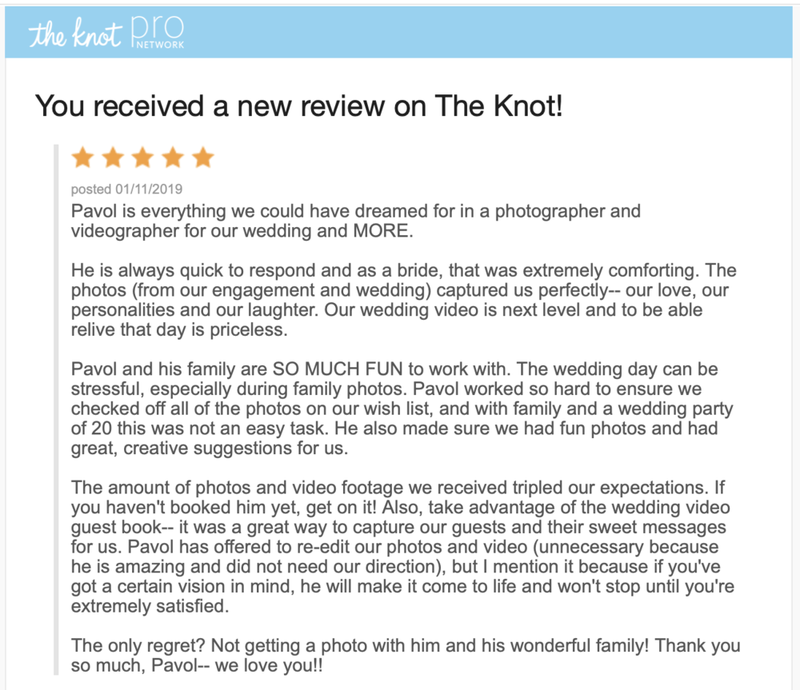 Pavol not only filmed each event with professionalism and attention to detail, but he edited and sent the finished product within weeks of the wedding. His warm and friendly demeanor was a welcome addition to our wedding celebration and he documented each moment as it occurred with ease and with respect to the intimacy of the day. Choosing Kasala Productions to record our wedding events was one of the best decision I made through the wedding planning process because my family and I are now able to relive one of the greatest celebrations of our lives again and again with beautiful and professional video footage. If you are looking for a videographer who goes above and beyond, pays attention to detail, and adds their own special touch Kasala Productions is the right choice! They were so easy to work with, and really made sure they knew the schedule of when everything was happening so they could catch every single thing. They interviewed our wedding party without us having to ask, which is such a great treasure for us to have. The highlights clip they made for us was wonderful and a year later I still get comments on it! Kasala Productions truly blew our expectations out of the water! I would recommend them to anyone! It looks great! We love it!! Thank you so much for giving us such an amazing gift. We will cherish it forever!